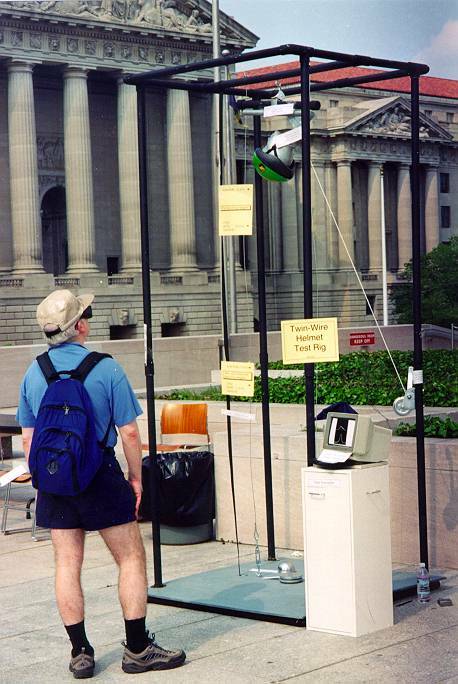 BHSI was invited to exhibit at the Smithsonian Institution's program "Re-inventing the Wheel" on May 6, 2000. The exhibit was part of a month-long concentration on bicycle events by the Smithsonian's Lemelson Center, and took place at the National Museum of American History. Most of the other exhibits featured old or unusual bicycles. 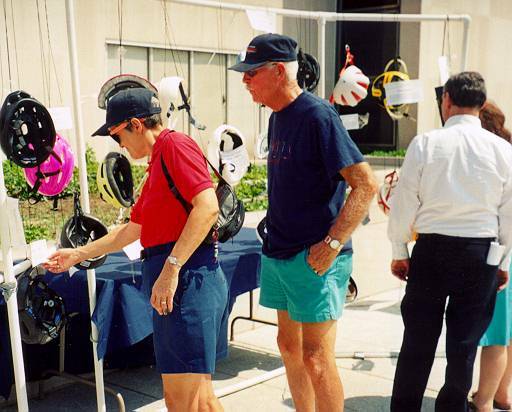 Our exhibit traced the history of the bicycle helmet through the 20th century, with examples of turn-of-the-century leather "hairnets," some of the "helmets" sold to bicyclists in the 1970's before there were helmet standards, and the post-1984 period when standards were in place. The role of standards in improving protection for bicycle riders was evident. We also exhibited a full size model of a twin-wire helmet test rig. 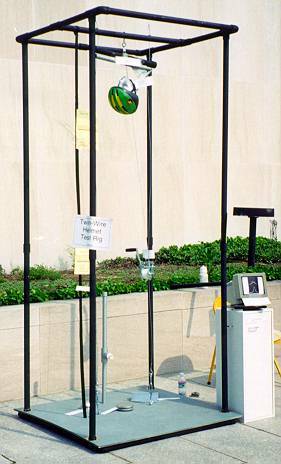 Although not a working rig, it showed all the major components and gave the people who attended a feel for the height of lab test drops. There are accurate reproductions of the flat, hemispherical and curbstone anvils, and the drop heights were indicated by labels. The data acquisition cabinet at the right showed examples of the curves generated by helmets that passed a standard and those that did not keep the impact below 300 g's. And this angle shows that it was the Smithsonian! If your interest is in helmet history, check out our Helmet History page. And here is a link to the exhibit sponsors, the Smithsonian's Lemelson Center. 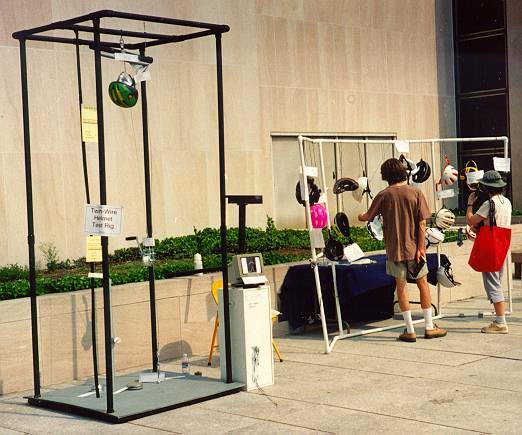 The helmet test rig part of this exhibit was shown again during Bike DC on September 22nd, 2001 at Bicycling Magazine's Great Gear Exchange and WABA's Kid Safety Rodeo. We set it up again for WABA's Bike to Work Day on May 7, 2004. And it was on display in Arlington, VA at the Phoenix Bikes Annual Show on April 30, 2009.